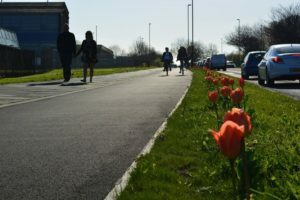 “I run a business and raise my kids in North Tyneside, but I’m sick to death of seeing my family intimidated on North Tyneside’s badly designed streets. I’m trying to do the right thing, I’m employing people, making a contribution, looking after my family’s health, but my right to get around is somehow less valuable when I’m on my bike that when I’m in my car. For my sake, my kids’ sake and for everybody else in North Tyneside I want to see North Tyneside do more to make using a bike for short trips the obvious, safe, and convenient choice for its residents. Fundamentally, this means building a network of cycle routes across the borough which are suitable for all from age 8-88 years old, and connect residential areas, town centres, and major centres of employment.